Irish bell features fine china that is enhanced with a shamrock handle along with the shamrock trellis motif. An old Irish tradition is to give a bell on the occasion of a wedding. A decisive moment is always announced by the ringing of a bell and in Irish culture it is no different. The bell affords good luck and if at any time during the marriage there is discord, the ancient Irish remedy for lovers quarrels is to ring this make up bell, breaking the spirit of discord and renewing the spirit of love. This fine china Irish bell is enhanced with a shamrock handle along with the shamrock trellis pattern along the skirt. 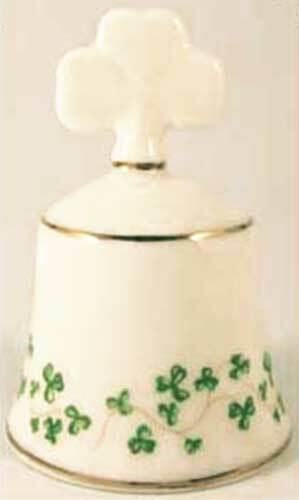 The shamrock bell is suitable as an Irish make up bell and it measures 3 1/2" tall x 2 1/4" wide at the base. The Irish bell is made in Ireland by Royal Tara China and it is gift boxed with history cards for the shamrock along with the bell legend, complements of The Irish Gift House. Irish bell features fine china that is enhanced a shamrock handle along with a Celtic motif. Brass Claddagh make up bell is enhanced with Celtic knot-work. Brass Irish bell futures a shamrock handle along with embossed Celtic knots along the base. Irish bell is a ceramic design that features the Irish blessing along with shamrocks. Irish bell features the Claddagh.